Jamaica Plain ceramist Isabelle Abramson’s artistry is all in the delicate details. It takes Isabelle Abramson three to four hours to drill and clean out the hundreds of individual holes in just one of her lacy, coral-like porcelain bowls, but the Jamaica Plain ceramist and school nurse doesn’t seem to mind. Abramson, 28, always knew she would be an artist. She says she sewed, gardened, and cooked during her “free-range childhood” on the North Shore and spent an especially influential year drawing and painting at the Putney School in Vermont. But after a year and a half at the Museum School in Boston, she lost steam. “I was so afraid of graduating and not being able to make money,” Abramson says. So she transferred to Boston College and graduated with a nursing degree in 2006. Abramson landed a job as a nurse at a private school in Brookline and discovered the pottery studio Feet of Clay just down the street. Today she works in a studio in Jamaica Plain as well as a space at 450 Harrison Avenue in the South End. In her JP workshop, an old radio and a coffee tin of peacock feathers rest on a desk in the corner; pages ripped from Elle Decor hang on the walls for inspiration. She’s surrounded by shelves full of her delicate milky white vases, mugs, and bowls. Sprawling black sketches of feathers decorate some pieces; others have silver rims and detailing. At the moment, Abramson is working on one-off eight-piece dish sets and a set of nesting bowls. She’s painting more of her work and planning to experiment with bone china. Courtney Hollands is a senior producer at Boston.com. 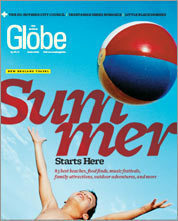 Send comments to designing@globe.com. The region's top attractions for getting the most out of summer.